Stuck in a post-Culture Night fugue? Terrified by the prospect of yet another brewery-sponsored-riot-of-rampant-consumerism-masquerading-as-a-national-holiday-that-somehow-celebrates-bare-chested-breakdancing-in-broken-glass-on-the-cobblestones-of-Temple-Bar next week? Looking for something this weekend that blends the best elements of culture and riot with the occasional pint thrown in for good measure, without the evil taint of capitalism (or cobblestones)? 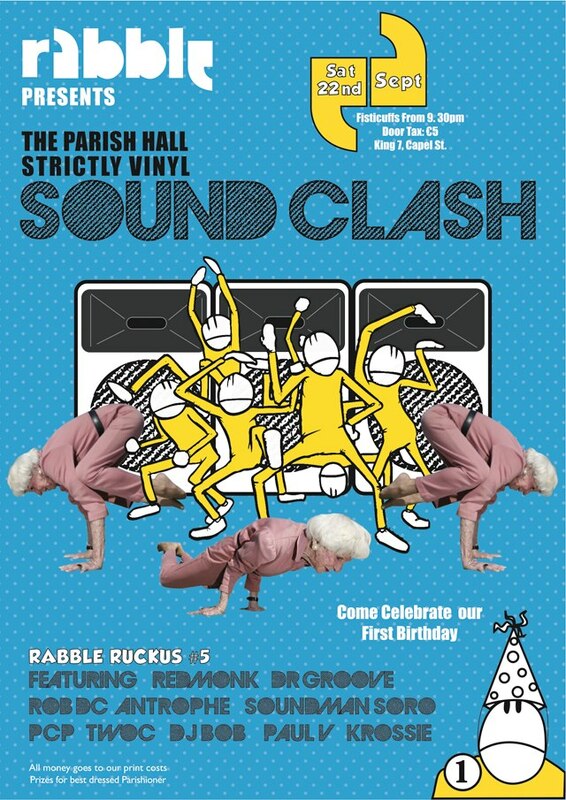 Then let me recommend to you Rabble's Parish Hall Strictly Vinyl Sound Clash, in honour of their first birthday, this evening from 9:30ish at King 7 on Capel Street, featuring a bevy of old-style turntablists who hold no truck with your MP3s and other digital chicanery. In the last year Rabble has successfully put out four issues of a free paper, composed, illustrated, written, edited and distributed entirely by volunteers, and as they get ready for the next four and more they thought it was time to let their hair down, party with all their friends, and maybe solicit a donation or two to help cover future costs. Unkie Dave will be along, but as he is old and sober he cannot promise to be the last one propping up the bar, but stranger things have happened.